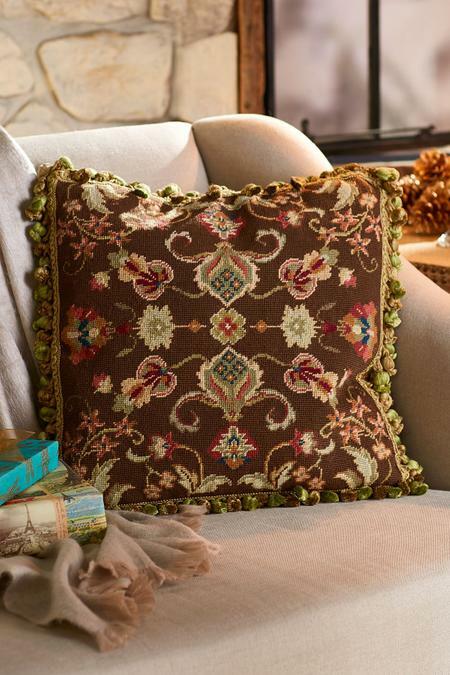 This stunning statement pillow reaches next-level grandeur with its refined hand needlepoint design in rich, lush wool. Many designers use this type of luxe, standout pillow to provide a final finishing touch to neutral bedding or a special seating area. Jardin d'Automne translates from French to mean "Autumn Garden" and that's just what our exclusive accent pillow depicts. A luscious trim of embroidery and mini pompoms elevate the edging; soft velvet comprises the back; a hidden zipper is tucked beneath a rear placket; and the special insert is feather and down.